This article first appeared March 24, 1956, in the publication Mayovox. 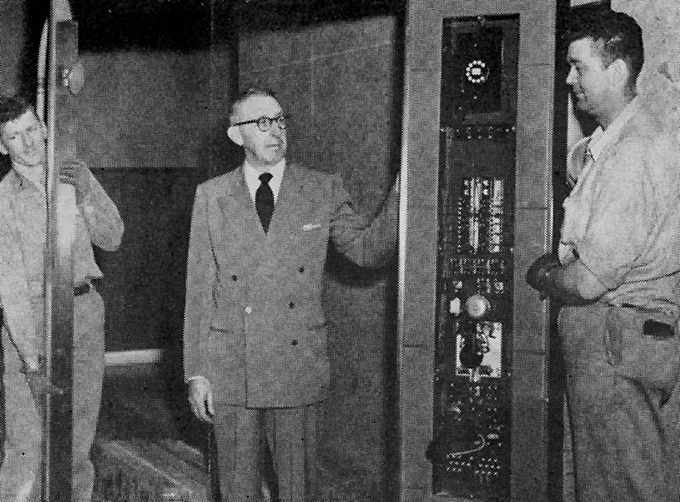 Shown here with General Service’s Clyde Crume are Westinghouse elevator men Elton Butlin and Floyd Dawley, at work in the patient elevator of the second floor, New Building. The work comes as a result of a series of studies of New Building elevator operation last year by the Building Committee, General Service and the Westinghouse Co. Specifically, Dawley and Butlin are moving one car from the north bank of patient elevators to the formerly unused sixth shaft in the south bank. The south bank as a six-car operation will be completed in from four to six weeks. Why the change? Because checks and re-checks proved that six cars working in unison in a single bank will provide better service plus more economical operation than “split bank” (i. e., running several cars in each bank) operation. For the technical-minded, some results of last year’s surveys might be of interest. Good service is an interval of 25 to 40 seconds of waiting. Last year’s study showed an average wait of more than 50 seconds for cars in the north bank and about 41 seconds for the south. Studies by Westinghouse engineers indicate that six cars in one bank will result in a waiting intervals of only 23.5 seconds. You may recall that seven patient cars were operated last summer, four in the south bank and three in the north bank. Thus, transfer of one car to the south bank makes possible a reduction in total number of cars in operation (a cost saving), and a considerable improvement in service to patients as well. Does this mean that all six elevators will be in operation continuously? No. Demand for service varies sharply at different times of the day. And this is another “plus” factor, since cars can be taken “out of service” in turn during slack periods for regular safety and mechanical checks. Of course, the Building Committee points out, the entire elevator operation method would change if substantial increases in patient traffic were to occur; then, it probably would be necessary to resume the “split bank” operation. But past experience has demonstrated that, in this operation, the south bank carries considerably more than half the traffic. Thus; the division of the ten patient elevators on a six-bank and four-bank basis seems desirable both from the long term as well as short term point of view. But the immediate point is this. For the foreseeable future, the most efficient and economical method of patient elevator operation for the New Building is to use a single bank of six cars.